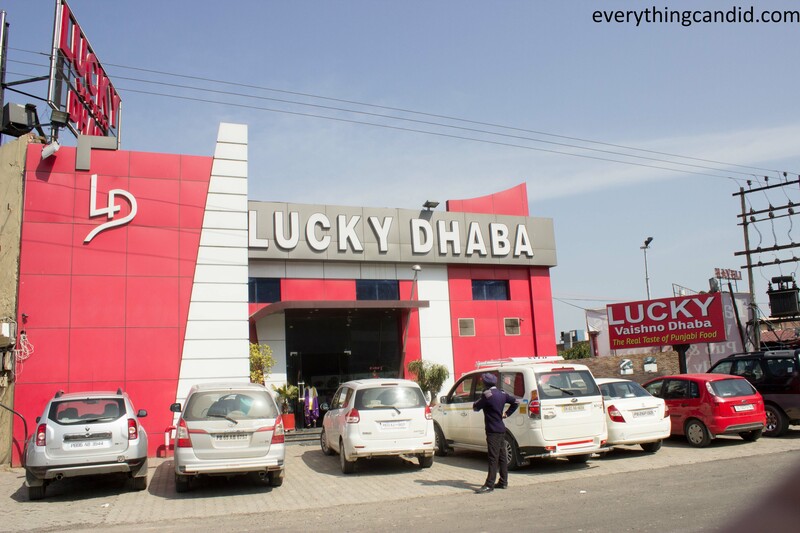 This time the candid dhaba destination is Lucky Dhaba at Jalandhar which is one of the oldest dhaba on NH1. 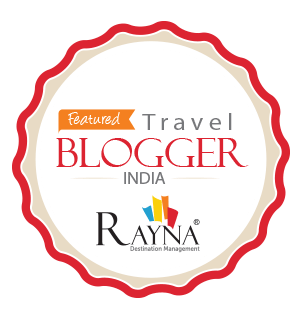 NH1, one of the busiest highway and a pathway to many travel destination towards Himalaya, boasts of numerous Dhabas dishing out Desi food all along. 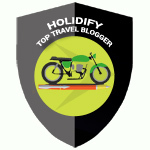 These24x7 dhabas are a gift to overworked truck drivers, young holiday makers heading towards Himalaya, adventurous road trippers like me who loves road more than the destination, forever enthusiastic Bullet bikers and nearby city folk alike which make entire stretch of NH1 from Delhi to Amritsar a destination in itself. During my recent road trip to Jalandhar, I made it a point to stop at Lucky Vaishno Dhaba and also to meet the owner of this iconic dhaba which boasts of a clientele that includes who is who of Indian politics since its inception in 1967. 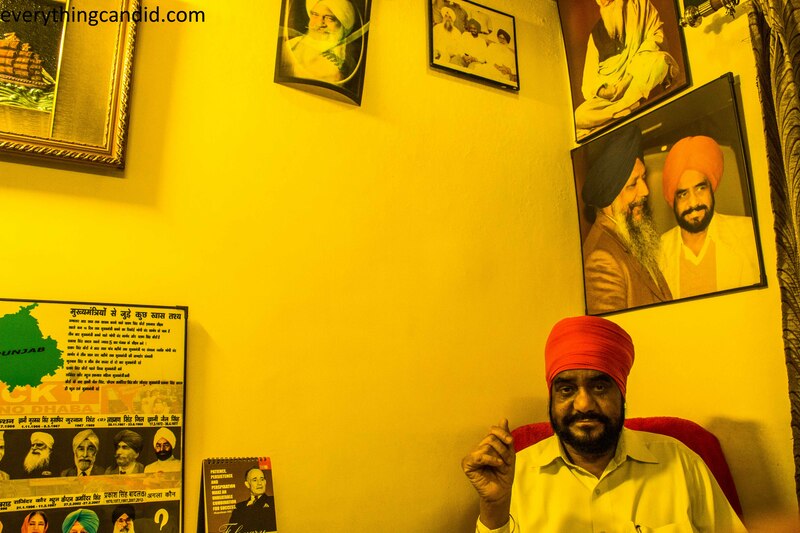 The owner Mr. Jasbir Singh is a proud collector of everything related to his Dhaba and also a master storyteller when it comes to his Dhaba. He generously spared time for me and showed me all the articles ever published on his dhaba. This Dhaba was started by Sardar Waryan Singh, father of Mr. Jasbir Singh, who came to Jalandhar from Sialkot in present days Pakistan. This was my third visit to this dhaba but first as a blogger and hence I a more responsible one equipped with Holmesian instinct. I visited entire premise from kitchen to bathroom this time. The best part is the kitchens of this Dhaba are open for all to inspect. Mr. Jasbir Singh proudly claims that his kitchens are the cleanest kitchen in Indian Dhabas. On the wall of dhaba three photographs are hanged which tells the story of the evolution of this dhaba from truckers’ dhaba of 1967 to a swanky destination dhaba of today. And this also vouches for my theory of evolution of dhaba which is put forth in my earlier post on Giani Dhaba at Gajraula. 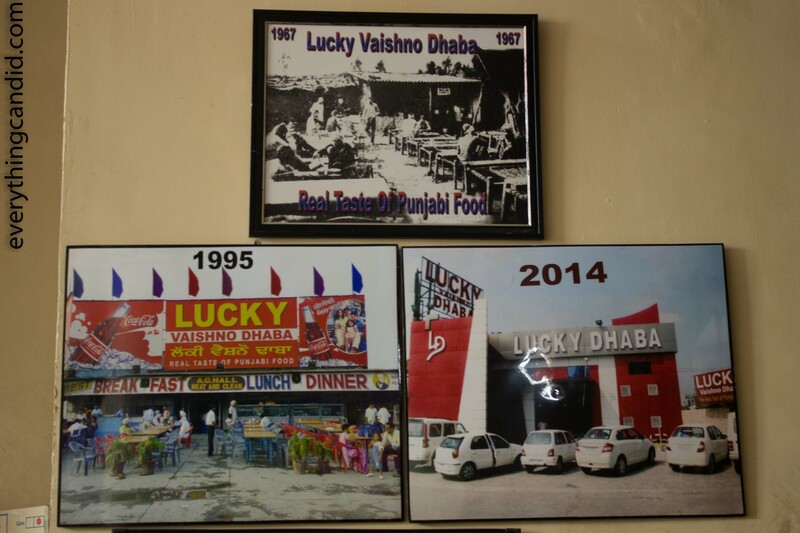 Photographs of Lucky Dhaba: 1967, 1995, 2014. Evolution of Dhaba. For ordering purpose I went by the suggestions of the owner and ordered Mix Veg, yellow dal and assortment of Missi Roti and Tandoori roti and Lachha paratha. And thus I was all set for another unique Punjabi culinary experience — a combination of earthy hospitality, somewhat modern ambience and spiced up high calorie food. 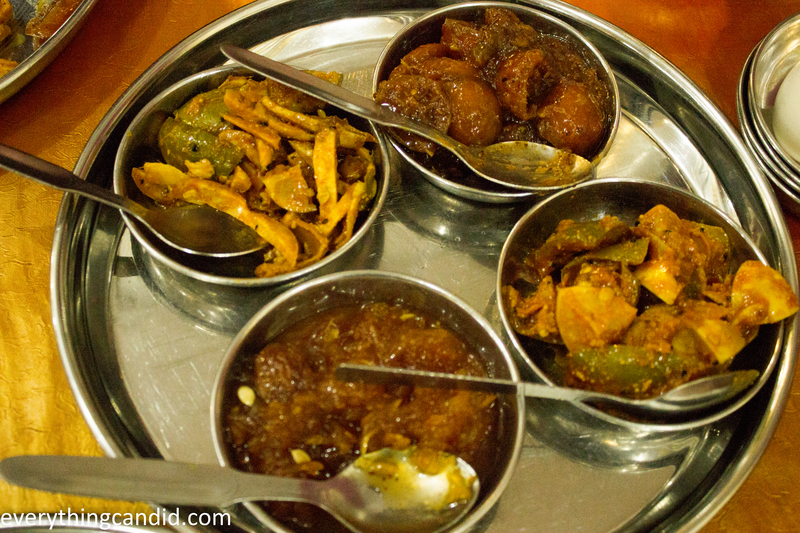 First came the assortment of pickles and all were concocted by the cooks of the dhaba. The aroma and flavours augmented our hunger manifolds and we tasted every pickle before food could be placed before us. And then came the food we ordered and literally the accomplished foodie inside started acting like a child when food was placed before us. The missi rotis served here were the best I have ever had. They were topped up with Capsicum and Onion which added freshness to it and made it more palatable. Assortment of pickles added all the remaining flavors to the food and we finally ended up eating more than what our tummy could afford. 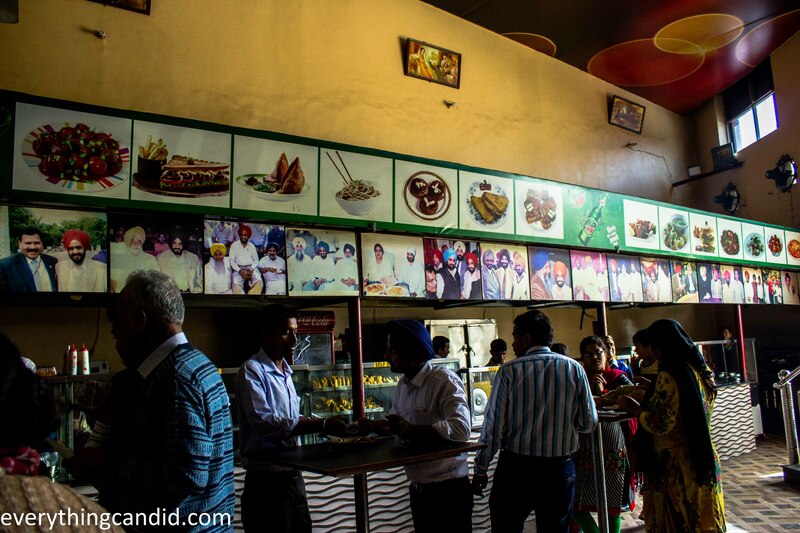 Punjabi Dhabas are known for their finger licking food and Lucky Dhaba stood by this fact. I spoke to few fellow travelers and went thru the articles as shared by the owner and realized that lucky Dhaba has gone one notch up and have acquired a Cult Status. The food at this Veg-Only Dhaba is great really authentic Punjabi food and for any road tripper heading towards Amritsar or Jammu/Kashmir it’s a must stop Dhaba on NH1. 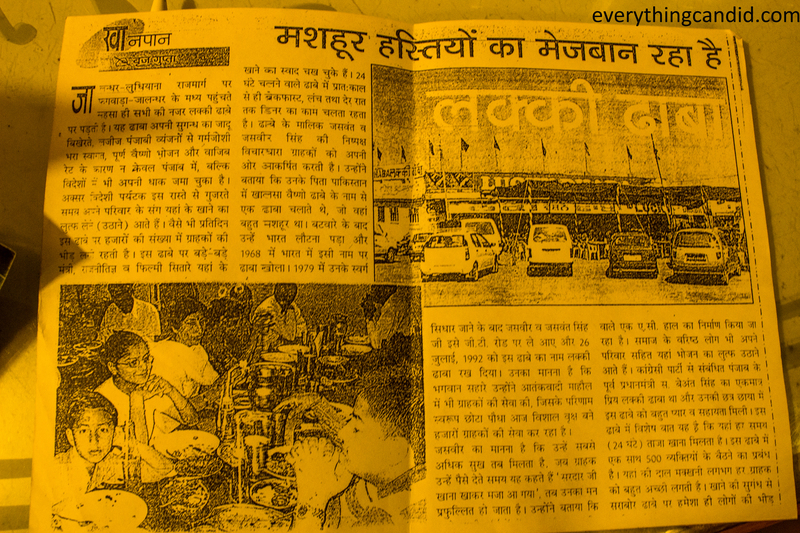 Ha ha… you must tag dhaba visit in your traavel plan. For me they go hand in hand. Thank u so much sir… ur comments are always encouraging. We’ve a no. 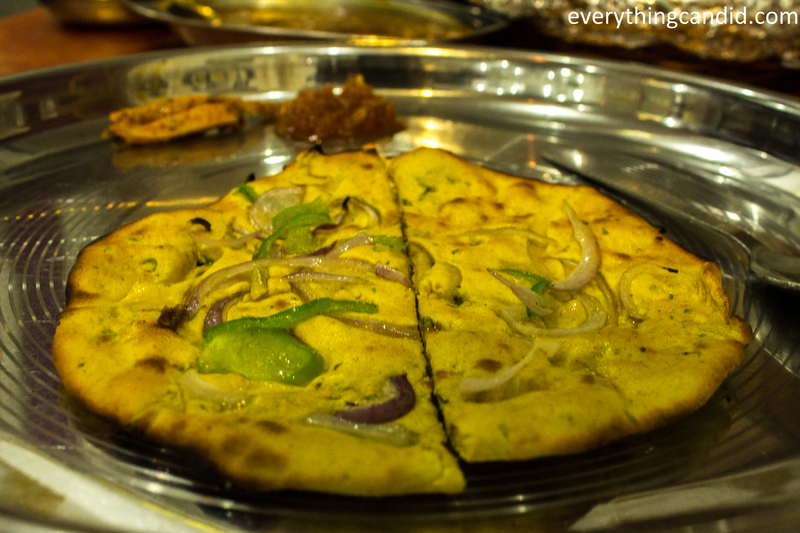 of dhabas here in Kolkata and outskirts who serve authentic Punjabi food. I love eating at dhabas 😀 Delectable dishes!